Who doesn't like great garlic bread? Yeah, pretty much nobody with normal taste buds. This recipe is packs a few extra ingredients (OK maybe a lot) that bring some new flavor dimensions to what can otherwise be mundane. This bread is as comfortable alongside a nice grilled steak as it is with a plate of pasta, or even just a salad. You can even grill it (after it bakes) for a little more rustic flavor. The recipe makes much more than you will need for a loaf of bread, but it keeps well, and it can be used for all manner of other things. For example, you could drop a tablespoon on top of a steak just off the grill, or melt it on top of some nice roast chicken. Shoot, you could even use it to make some killer butter garlic noodles, or homemade croutons. You're feelin' me, right? Put three or four tablespoons of the butter in a small sauce pan over medium heat. When the butter is melted, add the oil, garlic, parsley, Montreal Chicken seasoning, and cayenne to the pan. Cook the mixture for about three minutes, stirring frequently. Remove the pan from the heat, add the honey and vinegar, and mix well. Combine the rest of the butter and the pan ingredients in a small mixing bowl. Add the cheese to the bowl, mix well, cover and refrigerate. Slice off about half an inch of the baguette, lengthwise. Smear the cut side of the baguette well with the butter mixture. Bake the baguette per the package instructions (typically 6-8 minutes). I can just smell the bread wish I had some right now. Yum!! I am such a carb freak - I just want to reach through this screen. I love the addition of honey and balsamic vinegar to the butter. Never thought of that on bread. Delicious! YUM! I will be trying this soon. I make compound butters all the time but like Jenna said above, the addition of the honey adds some complexity! 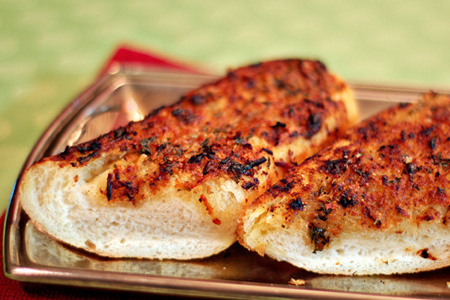 Oh my gosh, garlic bread is my all-time favorite smell in the world! (And it's definitely up there in my favorite foods, too!) This recipe looks like it would be super delicious. I'm going to try this on the grill in the summer. I love plain old garlic bread, cheesy garlic bread, and pretty much any bread with garlic. This sounds wonderful. I just might have to work it into my menu plan for tomorrow!